Previous to the explosion of information the Internet has brought, those of us wishing to do research had to use university libraries and purchase rare expensive books. My own research into the Reformation began this way. Now, what was once costly and obscure is often seconds away at the touch of a mouse click. Often these books are found in the "public domain." These books can be well over one hundred years old, and while often containing otherwise obscure information, a significant flaw is that investigative scholarship does not stand still, and what may have been good scholarship one hundred years ago has been surpassed. Think of some of these books as Windows 95 or 98 and compare what those systems could do to what's available today on an average cell phone. One of the most popular sources for quoting Luther is the Tischreden, in English known as the Table Talk. The Table Talk is a collection of second hand comments written down by Luther's friends and students, published after his death. Probably half of my Roman Catholic Luther studies involve tracking down obscure Luther quotes, and more often than not, these quotes find their way back to the Table Talk. It often appears to fall on deaf ears when I point out to the defenders of Rome that Luther didn't write the Table Talk. 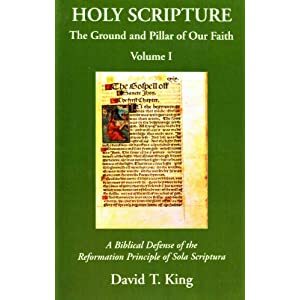 Since the statements contained therein are purported to have been made by Luther, they should serve more as corroborating second-hand testimony to something Luther is certain to have written. It was wonderful to find a recent Roman Catholic scholar pointing out that the Table Talk does not qualify unconditionally as a primary source. 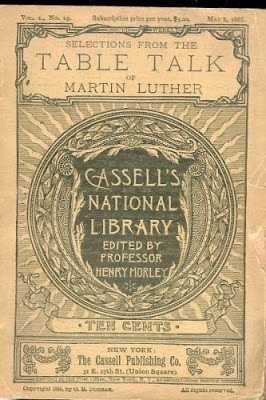 He stated "the real distortion of the Luther image occurred with the Table Talk" and that the Table Talk should be read for entertainment rather than as a serious historical guide. The Table Talk is a source that's available in multiple versions spanning the course of history since the Reformation. Within Luther research, studying its contents and the history of its publication has a life all its own. One can spend quite a long time attempting to grasp how this Frankenstein's monster was put together. Even after multiple years of using this source, when I come across an obscure Luther quote taken from the Table Talk, it usually takes more time to research. Who recorded Luther's utterance? Are there similar utterances? What is it's pedigree of reliability? Has it been translated correctly or fully from the original language? Which version of the Table Talk did it first appear in? What do we know of the context? What do we know of the date? What was going on at the time Luther is purported to have made the comment? These are the typical problems that each statement of the Table Talk brings to the table. Dris Martini Lutheri Colloquia Mensalia: Or, Dr Martin Luther's Divine Discourses at His Table, etc. With maybe the exception of Preserved Smith's 1915 publication, the rest are inferior to Luther's Works vol. 54. In fact, the majority of the editions above contain what appears to be a less than historical account of how the Table Talk was translated into English by Captain Henry Bell. The story put forth is that Luther's Tischreden was being sought out and destroyed by the authorities, but one copy was discovered in 1626 "in a deep obscure hole" and eventually translated by Bell. The story takes twists and turns of what it took for Bell to eventually get the book translated and published, including false arrest, years of incarceration, and political subterfuge. The crowning moment of its publication was the House of Commons in 1646 noticed that in the book Luther "revok[ed] his opinion, formerly held, touching Consubstantiation in the Sacrament." For a critical evaluation of Bell's claims, see: Preserved Smith, Luther's Table Talk, A Critical Study (1907) pp. 76-81. Smith challenges the notion that the German text was so obscure to find, or that it was ever under order to be destroyed on such a grand scale. Bell's ten year prison term is thought to be improbable. According to Smith, there isn't any evidence of Luther's changing view on the Sacrament in the text. The actual German text was probably from one of Aufifaber's editions, perhaps 1571, and what Bell put together was an incomplete translation (two-thirds may have been omitted from the German). Smith states, "The omissions were made with the purpose of pleasing the theologians of that day and place." The translation was also later attached to what Smith calls "the good old-fashioned style of invective" against Rome. It appears there were at least three English translations: Bell, an unnamed translator, and that done by William Hazlitt. The unnamed translator is responsible for those volumes above entitled, Choice Fragments from the discourses of Luther. According to Smith, 1832's "Choice Fragments" "suppressed with the greatest care whatever really showed the free, joyous and somewhat coarse character of Luther, and in his translation we see him transformed into an English clergyman with an unctuous regard for the proprieties, polished, well brought-up, grave and formal in his conversation." Hazlitt's translation (1848) seems to be the most readily available on the Internet. Hazlitt's preface takes parts of Bell's introduction and part of a French translation (Brunet) and includes the errors found in the French version. For a good list of the English versions of the Table Talk previous to 1915, see Smith's compilation. Best bet for English speakers: stick with Luther's Works vol; 54. While it's wonderful to have all these old editions of the Table Talk, having the more critical and careful edition shows a critical and careful love of history. The Reviewer, it has already been stated, gives no references for his extracts, a practice utterly to be reprobated when they are cited as the grounds of censure. The chief part however of the "hasty anthology" collected under the head of Biblical Criticism may be traced to Luther's Tabletalk; and when we compare these so-called extracts with the original passages from which they appear to have been taken, we discover more than one reason why it may have been thought expedient that the references should here be left out, though in other parts of the Article they are given carefully. In the first place the importance of the allegations, for whatsoever purpose they may be cited, is much diminished when they are known to come from the Tabletalk. Precious as that book is, both for the body of truths contained in it, and for its vivid portraiture of Luther's character and familiar habits, we are not entitled to regard it as a sufficient authority for Luther's opinions, except so far as it is confirmed by his acknowledged writings: at least we certainly have no right to make it the ground of accusations against him. For in all conversation there is much that is prompted, and, it may be, exaggerated, by casual impulses of the moment, much that, at the time of utterance, is limited by previous or subsequent remarks, and so cannot be rightly understood without them. Besides even the best hearers will often misapprehend and misconceive, the best reporters will often misstate, especially when the report is not committed to writing for hours, it may be days or weeks after. Some collections of Tabletalk are indeed very interesting 'and delightful; but they should always be read in an indulgent, not in a censorious spirit. The only safe rule is to ascribe whatever we find that is wise or ingenious or instructive, to the speaker, since this is not likely to have been invented by the reporter; while the blunders, the absurdities, the extravagances should be overlooked, from the probability that they may be the scribe's interpolations or perversions, or that they may have had some unrecorded justification at the moment. And these remarks apply with double force to Luther's, which is compiled from the manuscripts of a dozen of his friends. A second reason for the omission of all references might be, that, when it was seen from what a tiny spot in the vast expanse of Luther's writings they were drawn, this would have swept away all appearance of that extensive acquaintance with them which the Reviewer now seems to claim, but which his extreme ignorance of what Luther was proves he cannot have possest. There is also a third reason why it certainly is expedient for the Reviewer that his readers should not have any facilities for referring to the passages he professes to cite; for then any one would easily have detected how grossly several of them are misrepresented. At present, even if we fancy we have found them out, there is always a possibility that the same words may occur somewhere else, without the context, through the omission of which they convey a totally different meaning from what Luther intended to express by them. Nr. 3417–3462: Tischreden aus der Handschrift "Cord. B." Nr. 3463a–3463h: Tischreden aus der Handschrift Zwick. Nr. 3660–3682: Tischreden aus dem 1. Abschnitt der Handschrift "Math. L."
Nr. 4202–4318: Tischreden, die in der Sammlung B. und in der Handschrift Khum. ins Jahr 1538 dadiert werden. Nr. 4319–4719: Anton Lauterbachs Tagebuch aufs Jahr 1539. Nr. 4720–4756: Tischreden, die in der Sammlung B. ins Jahr 1539 dadiert werden. Nr. 4757–4857: Die Sammlung Khummer. Nr. 4857a–4857p: Tischreden aus der Handschrift "Dresd. 1. 423" und aus dem 7. Abschnitt der Handschrift Math. L.
Nr. 4858–5341: Nachschriften von Johannes Mathesius 1540. Nr. 5342–5378: Tischreden aus dem Jahre 1540, die wahrscheinlich nicht von Johannes Mathesius nachgeschrieben sind. Nr. 5604–5658: Tischreden aus der Handschrift "Clm. 937". Nr. 5676–5749: Tischreden aus der Handschrift "Clm. 943". Nr. 5750–5790: Tischreden aus der Handschrift "Clm. 939". Nr. 5791–5824: Tischreden der Handschrift "Bav." und "Oben." Nr. 5825–5889: Tischreden aus der Handschrift "Luth.-Mel." Nr. 5890–5941: Tischreden aus der Handschrift "Wolf. 3232"
Nr. 5942–5989: Tischreden aus Georg Rörers Handschriftenbänden. Nr. 5990–6507: Tischreden aus Anton Lauterbachs Sammlung "B."